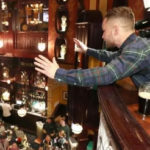 Frampton buys drinks for his travelling fans at an Irish-themed bar in Las Vegas. I am down in the dumps, but I am not going to not turn up because I lost the fight. The people who came out here have been amazing and I appreciate it. It is very humbling – we took over that arena last night.